3N2/D2E Lawmen & Dayton-Metro Emerge World Champions! The World Series added a major sponsor this year in the Texas based Garrett Metal Detectors. Assistant Tournament Director Kevin Schoch coordinated a well-attended player reception at the host hotel, the Golden Nugget courtesy of Garrett. For many it felt like a high school reunion as attendees visited with fellow cops they had not seen in a year at the previous World Series. The event has truly grown into a “World” series as it drew players from over 30 states and Canada. First time attendees included Honolulu’s Finest, Norsemen PSC (Minnesota), One Time (Arizona), New York Hounds, Disorderly Persons (New Jersey) and the return of former Silver Division champions Utah Unified. In total 74 teams participated and those teams were ultimately divided into three playoff divisions, Majors, Gold and Silver. Round Robin Thursday began at 7:30 A.M. in order to accommodate the 74 teams and ensure all teams recorded two games for playoff seeding purposes. In the Majors, the top seeds, and subsequent first round byes went to: Great Lakes Lawmen, SoCal Alliance, Ohio Lawmen, West Coast United, Missouri Lawmen, Shamrock Enforcers, the defending champions DEA Combo, and of course, the 3N2/D2E Lawmen. The only real “upset” was the 2010 World Champions NYPD Blues suffering a rare round robin loss at the hands of the fast rising Missouri Lawmen. 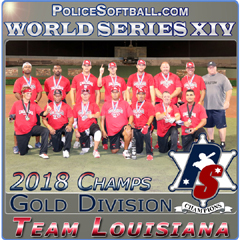 In Gold, the LA Lawmen, Nitro2GO, Border Patrol Arsenal, Dayton-Metro, Chicago Metro, Midwest Heat, Honolulu’s Finest, Miami Dawgz, Louisville Metro, Iowa Lawmen and the Texas Cartel all earned top seeds. Kyle Scollo is 12 years old and he aspires to one day play for his father’s favorite baseball team the New York Yankees. John’s close friends Rick Tirelli (NYPD Blues) and Mike Kletzky (Florida Enforcers) sponsored Kyle’s trip to the World Series as their special guest. Like a true brotherhood, players rallied to contribute to Kyle’s trust fund. 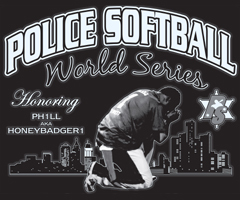 Kletzky’s team alone raised $5000 and by the end of the weekend the police softball community contributed almost $10,000. During the opening ceremonies, Kyle threw out the first pitch and then bravely took the microphone to address the 1,500+ in attendance. There were very few dry eyes in the house as Kyle explained how much his father meant to him and how he planned to make him proud. Brett Helmer (Easton) and Denny Crine (Miken) began loosening up as the top two home run derby participants battled head to head for the title of Police Softball Home Run King. The event was renamed the Dr. Charles Garrett Memorial Home Run derby in the honor of Dr. Garrett who was a long-time supporter of law enforcement. Over 70 of the games top hitters did battle for the opportunity to showcase their talents in front of the maximum capacity crowd at Big League Dreams. Only two remained. Representing the West was reigning Home Run King, Luis Velazquez (Nitro2Go) and his opponent from the East was former Home Run King, Dusty Bowling (Ohio Lawmen). In the 11 year history of the event there has never been a two-time Home Run King, but that would change as for the first time ever, two former champions were faced off. Dusty blasted 7 out of 10 balls over the fence to reclaim his crown and be declared the first ever two-time Home Run King. Dusty and Luis would then team to face Brett and Denny in a Pro’s vs. Joe’s exhibition derby. 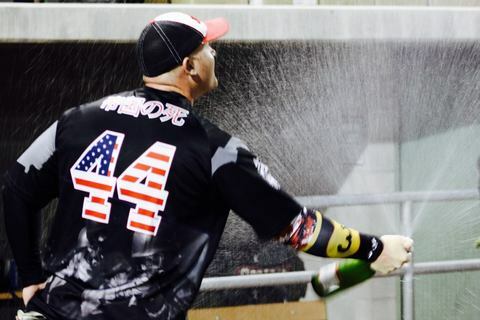 The shots off the bats of Brett and Denny drew shock and awe from the crowd and as expected, the Pro’s soundly defeated the Joe’s. Honolulu’s Finest were making their first World Series appearance. Little was known about their team so when they began piling up wins against established teams in the Gold Division such as the San Bernardino Hit Squad, Miami Dawgz, Wayne Oakland and the Steel City Enforcers they quickly became the talk of the tournament. They would eventually face the veteran Dayton Metro in the undefeated game and after yet another decisive win, Honolulu was sitting pretty in the championship game needing to be double dipped. 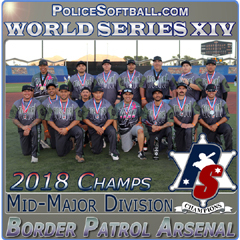 The reigning Major Division World Champions the DEA Combo had a banner year and traveled East more than any Western team in the history of police softball. They didn’t simply travel East, they conquered the East and earned the title “East-ecutioners.” They won the West Palm Beach tournament, Kansas City and St. Louis Bacon Ball events going undefeated in all of them. 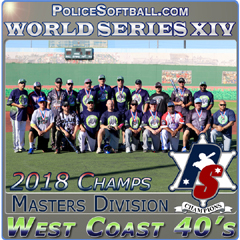 All signs indicated the DEA Combo were dialed in for a repeat of the 2014 World Series, but they were derailed by the Western Conference Las Vegas based Battle Born squad who sent them into the loser’s bracket early. They had a long road ahead. 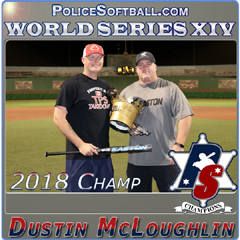 Dayton Metro had marched through the winner’s bracket with wins over the Regina Cyclones (Canada), Stanislaus Combo, Thin Blue Line and the LA Lawmen before they were sent into the loser bracket by Honolulu’s Finest in the undefeated game. The average player’s age on Dayton Metro was 41 and their pitcher Rocky Alexander was north of 50. They had a shallow roster so there were no fresh legs to spell the veterans. It seemed unlikely they would be able to defeat the LA Lawmen once again and then double dip Honolulu’s Finest. Although it seemed unlikely to nearly everyone in attendance, it seemed like a sure thing to their die-hard (and very vocal) fan base. 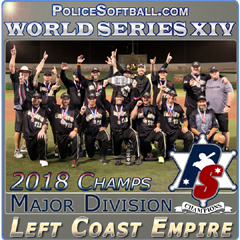 There is a reason the SoCal Alliance is called the “Evil Empire.” For the past decade plus, they have been most successful team in police softball. Their 70-14 all-time World Series record and four Majors World Championships seem almost impossible to wrap your head around. Their numbers seemed video game-esque compared to the rest of the nation. No other team has ever won 2 World Championships, but these guys have 4 rings! The scary thing is, they were having their best season to date. They had won EVERY tournament they played in all year and had only lost one game which was merely a round robin game. Their line-up was stacked, their roster was deep, and they were white-hot coming into Vegas. The only people cheering for the Alliance were wearing the burnt orange team colors of the players and their family members. Although it felt like it was the Alliance against the world, the team seemed to embrace their role as being the tournament villain (Darth Vader) who needed to be slain. Despite all the press clippings, an inspired Team Texas accomplished what few, if any, believed was possible. They sent to the Alliance into the loser’s bracket in the first playoff round. Silently, the masses rejoiced as Texas had wounded the dark side. The Maryland Young Gunz were a borderline Majors/Gold team all year. On paper, they were fielding their best team as everyone was healthy and they were not missing any key players. Although they ended up in the Gold division, most expected them to be in contention for the title come Saturday night. What nobody expected was two quick losses at the hands of Wayne Oakland and the SoCal Riot. So they were playing for the title on Saturday night, but it was in the Silver Division. Those losses lit a fire under the Young Gunz and they turned into an absolute buzz-saw cutting through their opponents with vengeance. Their offense was putting up 30-40+ runs every game as they were dropping opponents like dominoes. The Silver Division championship featured a classic East vs. West matchup and the Gunz hoped to stay hot against an equally impressive El Dorado Cartel based out of Northern California. It figured to be a shootout, but in the end it was the Young Gunz who shot early, often and were unrelenting. They plated over 40 runs to claim the Silver Division Championship and in doing so proved to the doubters that they were and still are a team to be reckoned with in the circuit. The 3N2/D2E Lawmen arrived in Las Vegas with a purpose! The 3N2/D2E Lawmen were donning special custom sports sleeves with the #3 on each of them. That was John Scollo’s number during his playing days with the team. They seemed to be playing at a different level than all the other teams that particular weekend. They were using their home runs wisely, wearing out the outfield gaps and playing shut down defense. Their 2 convincing round robin victories gave them a first round playoff bye. And come playoff time they collectively elevated their game to even a higher level. In the winner’s bracket they were dispatching big ticket opponents such as the Minnesota Lawmen, Missouri Lawmen, Battle Born and the Great Lakes Lawmen. They headed back to the hotel to rest, refuel and remain focused for the championship against whoever would emerge from the loser’s bracket. Honolulu’s Finest players were relaxed and seemed to be living the slogan “hang loose” as Hawaiian folk music gently drifted from the speakers on Angel Field. They were waiting for Dayton Metro to drag their gear (and fans) over for the championship game. Honolulu was fresh, rested and ready. Dayton Metro on the other hand were collectively hot, tired and battle wary. The game had the makings of a blowout. Instead, it was Dayton Metro who pulled a rabbit out of the hat to win the game and force an “IF” game. The two SoCal based Major Division powerhouses the DEA Combo and SoCal Alliance had both embarked on the “Pack Your Bags” tour. Both teams were sending their opponents packing as they rolled all the way through the loser’s bracket by defeating highly talented opponents. The DEA notched wins over OH5O, Arizona Ablaze, Team Texas, NYPD Blues and the team who put them in this situation to begin with Battle Born. Meanwhile the Alliance was doing the same with opponents such as SoCal Lockdown, Central California Connection, Shamrock Enforcers, the Missouri Lawmen and the Ohio Lawmen. It seemed inevitable that the DEA Combo would face the SoCal Alliance for bragging rights as to who would be the top ranked team in the West. They were the final two West Conference teams standing and the winner would undoubtedly secure the final top ranking on policesoftball.com. It was a low scoring, scrappy, close game but the SoCal Alliance managed to record the victory and eliminate the defending champions. The Alliance carried that momentum into the 3rd place game against the Great Lakes Lawmen and secured their 7th win in a row in the loser’s bracket to eliminate Great Lakes. The “If” game between Honolulu’s Finest and Dayton Metro was a see-saw affair. Just as you thought one team was going to run away with it, there would be a momentum change that would often equate to a lead change. The Dayton Metro players were amped, their fans were on the edge of their seats and there was electricity in the air. Conversely their opponents from Hawaii seemed calm, laid back and carefree. In the dugout this stark contrast was obvious, but on the field both teams were going all-out. Both teams were determined to win and both refused to lose which resulted in extra innings. Finally in the bottom of the 9th inning (yes the 9th inning) Dayton Metro delivered by plating the final run on an infield single. Their fans charged onto the field to join in the celebration. Dayton Metro was crowned Gold Division World Champions for the first time! Their opponents, Honolulu’s Finest showed a great deal of respect for their opponents and the sport by humbly shanking hands and stepping off the field to allow Dayton Metro the opportunity to celebrate. 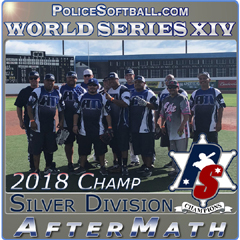 In their first World Series appearance, Honolulu’s Finest had advanced all the way to the championship game and finished runner’s up so they had no reason to hang their heads. The 3N2/D2E Lawmen arrived in Las Vegas with a purpose! They were in control of the game from the first pitch. They were dominant on offense and defense. Every attempt by the SoCal Alliance to rally was thwarted by the 3N2/D2E stonewall defense. Meanwhile the 3N2/D2E Lawmen offense was firing on all cylinders. In the bottom of the 5th inning the 3N2/D2E squad needed only one run to put a nail in the Alliance coffin. The pitch was down and away. 3N2/D2E Lawmen sparkplug Matt Tindell must have known it was coming as he loaded up and sent an opposite field homerun over the protective netting on Angel Field to win the game with a titanic shot. The Empire had been slain. The 3N2/D2E Lawmen celebration was grand. Their smiles were huge, their hugs were powerful and their joy was genuine. Champagne bottles were popped, players were showered, and “We Are the Champions” blasted loudly from the speaker system. The 3N2/D2E Lawmen arrived in Las Vegas with a purpose! And John Scollo smiled. On behalf of Policesoftball.com we would like to thank Brett Helmer & Easton Sports, Denny Crine & Miken, Terry Dugan & Lockdown Sports, Carlos Vega and Elite Sports, Dennis Leonard & 3N2 Sports, Garrett Metal Detectors, Anthony Costanzo/Kevin Mickelson & Sacramento County Deputy Sheriff Association, New Equity Productions/NEP, Big League Dreams General Manager Chris Devlin and his terrific staff, USSSA Crew Chief’s Ernie and Nicole Ono and their outstanding crew, Softball Magazine, Kevin Schoch, Norm Coe, Tyson Becker, Pete Salvaggio, Mike O'neill and all who assisted with the event, the Golden Nugget Hotel/Casino, and finally all who donated to the Kyle Scollo fundraiser.